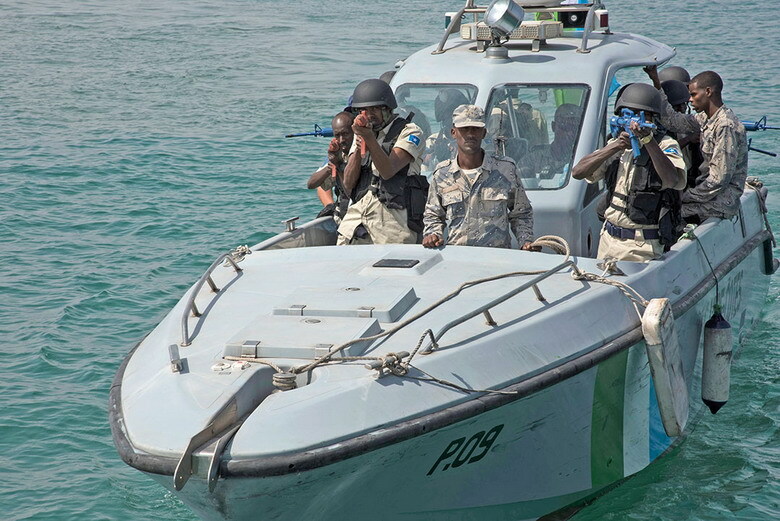 When military forces from Africa, Europe and the United States conducted the seventh Cutlass Express maritime exercise in 2018, they were joined by the Somali Maritime Police — the first time in nearly 30 years that Somalia had participated in any security exercise outside its own borders. Participation in a military training exercise is a significant step for Somalia. The country has yet to fully defeat al-Shabaab extremists, and it relies on 22,000 African Union Mission in Somalia peacekeepers from six other African countries. In August 2018, the United Nations Security Council extended the mission until May 2019. Somali Minister of Internal Security Mohamed Moalin Hassan acknowledged his country’s problems during the opening of the exercise in Djibouti. A stable Somalia is key to security in the region and beyond. The country has mainland Africa’s longest coastline at 3,000 kilometers, and it connects East Africa to the Middle East. Despite threats of piracy, billions of dollars in cargo pass through its waters each year. The country’s abundant resources, including iron, copper and uranium, have been largely untapped, and scientists believe it has huge amounts of offshore oil. The country has a proud military past. In the first years after the British Somaliland protectorate and the U.N.-administered Italian Somaliland colony unified and became a country in 1960, Somalia was stable and relatively prosperous. Before the civil war broke out, it had one of the largest armies on the continent. The country later lapsed into decades of military dictatorship, civil war and now, armed insurgency. In recent years, some Somalis have turned to piracy. Oceans Beyond Piracy’s “The State of Maritime Piracy 2017” report said that East Africa had the highest total economic loss from piracy in the world, at $1.4 billion, down from $1.7 billion in 2016. “The threat is posed by hijacked vessels, more than in the other regions where the nature of incidents is more related to kidnapping for ransom, or the kidnapping of cargos and yachts,” the report said. The United Nations said that Somalia’s lack of a stable government has contributed to the piracy problem. The Somali National Army now has about 12,000 active Soldiers, with another 24,000 in reserve. Its equipment includes 140 tanks and 430 armored fighting vehicles. Its Air Force has been slowly rebuilding since 2012. The current budget for the country’s entire armed forces is $58 million. Somali leaders say they need to build an army of 28,000 professional Soldiers in addition to a police force of 12,000. Instructors from the United States have helped train a rapid-reaction force known as Gaashaan, which translates to “the shield.” The force can operate under difficult circumstances, such as fighting inside enemy lines. U.S. forces help plan Somali military raids against al-Shabaab and provide helicopters that carry Somali troops to their targets. The United Nations has provided in-country maritime law enforcement, engineering and communications mentors who have trained Somali Maritime Police and Coast Guard units. Somali Maritime Police also have benefited from advanced training in the Seychelles on visit, board, search and seizure operations. U.N. mentors routinely review security conditions at Somali prisons to reduce the risk of escape or mistreatment, especially for prisoners in the Piracy Prisoners Transfer Program. In 2010, the United Nations established a trust fund to support initiatives in countries fighting piracy off Somalia. In 2017, the United Nations Office on Drugs and Crime gave three new patrol boats to the Maritime Police Unit. The skiffs are better-suited to the rough seas off Mogadishu than the dhows they replaced, the U.N. said. The versatile boats now patrol around Mogadishu 365 days a year, after 20 years without regular patrols. In 2014, Somalia signed military cooperation agreements with Italy and the United Arab Emirates. In 2016, Turkey started building a new military camp in Mogadishu. The base will be used to train Somali Soldiers. About 200 Turkish Soldiers will train Somalis. Turkey also plans to build a military school. In March 2018, the European Union Training Mission Somalia conducted a live-fire training exercise with the Somali Maritime Police Unit to help the unit patrol. Somali officers learned rifle handling and shooting range procedures. The Maritime Police Unit also trained with the European Union in September 2017, working on patrolling and boarding vessels. Trainers said the goal was to help Somalia protect its principal port in Mogadishu, along with its approaches. Somalia’s participation in Cutlass Express 2018 in Djibouti and the Seychelles showed its commitment to improving East Africa’s combined maritime law enforcement, and promoting national and regional security. The U.S. Coast Guard and Turkish military in Djibouti provided Somali participants hands-on training for visit, board, search and seizure missions in addition to pier-side and at-sea vessel boarding. The exercise lasted eight days and included an in-port preparatory phase, five days of drills, and workshops in the Seychelles and Djibouti. Instructors said the Somalis were quick learners and showed what they could do in the final boarding exercise. Somalia had already announced that it would participate in Cutlass Express 2019. Cutlass Express is one of three Africa-focused regional Express series exercises sponsored by U.S. Africa Command and facilitated by U.S. Naval Forces Europe-Africa/U.S. 6th Fleet. The exercise falls under Africa Partnership Station, the umbrella program for the Express series of exercises and other outreach and capacity-building initiatives throughout Africa. Nations participating in Cutlass Express 2018 were Australia, Canada, Comoros, Denmark, Djibouti, France, Kenya, Madagascar, Mauritius, Mozambique, Netherlands, New Zealand, Seychelles, South Africa, Turkey and the United States.